As soon as the rumours of the film being made started to appear the Red Book being read as a framing device by an old Bilbo/Frodo/Sam was the first thing I thought of. Looking to bring back LOTR characters is one way to look at it but another is as you say to allow for a more direct adaptation of the Hobbit with a marked change in tone from LOTR. By altering the presentation of the films you can also alter the audiences expectations, no longer are they seeing the direct gritter view of ME from LOTR but rather a single Hobbits perspective of it. I think Frodo being a kind of narrator in the start and perhaps one or two times during the plot, for instance changing the perspective to gandalvs part in the events taking place during bilbos adventure, the white council, the necromancer etc, will work really really well! Imo it's keeping with Tolkien, it's necessary to link the hobbit film with the lotr, and this handle is as good as any other imo. PJ has said before that he views the hobbit and lotr as a continuous story in movie terms. anyway, if the frodo-news is true there is little point disagreeing, seeing as it's gonna happen anyway. Social Science's biggest problem, is social science. "The ring has awoken. It's heard its masters call"
As if he grasped an existing universe outside our Platonic cave, Tolkien channels an entire world, weaving expertly from myth and lore. The oustanding virtue is that all this scholarly erudition doesn't reduce his tales to mere Taxidermy. He achieves an Alchemy all of his own: he writes new life in the freshly sculpted clay of his creatures. I have, through the years become familiar with the very roots of Tolkien's myths and the roots of Fafhrd or Elric or Hyperborea and many a time I have relished the intricate ways in which demonic wolves, shape-shifter and spindly-limbed pale warriors can be woven into those many tales that become, at the end, the single tale, the single saga- that of what is immortal in us all. In creating Pan's Labyrinth I drank deep of the most rigid form of Fairy Lore and tried to contextualize the main recurrent motifs in an instinctive rhyme between the world of fantasy and the delusions of War and Politics (the grown man's way of playing make-believe) and in re-reading THE HOBBIT just recently I was quite moved by discovering, through Bilbo's eyes the illusory nature of possession, the sins of hoarding and the banality of war- whether in the Western Front or at a Valley in Middle Earth. Lonely is the mountain indeed. Reading him talk about Tolkien's work so enthusiastically makes me doubtful of that single statement he made in that interview several years ago, when he said that he hated hairy feet or something like that. To be honest, I'd be even more inclined to trust del Toro with Tolkien's work than I would be to trust Jackson. I was hoping for less LOTR reunions. First Legolas and now Frodo. 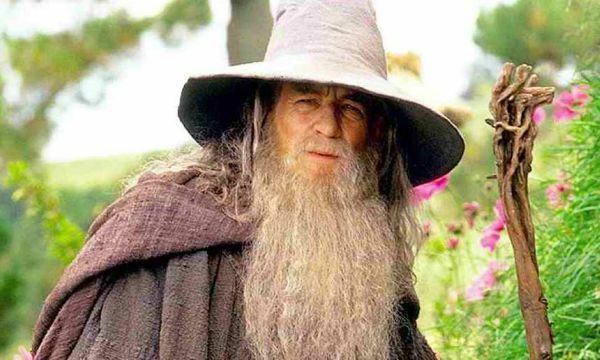 Saruman would be the one logical choice, yet we got more Radagast evidently. Flagg I have to admit that I didn't know who this "Frank Langella" you mentioned was, call me uncivilized or uncultured or whatever you like but, at any rate I decided to check him out on youtube. WOW! I agree with you 100% if someone is going to replace the legendary Christopher Lee as Saruman I am now convinced it must be Frank Langella! Not only is his voice superb (and eerily similar to Lee's) but, he actually LOOKS like him too! That's craziness. 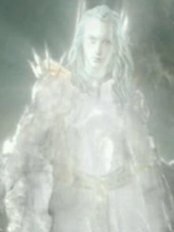 You have made a believer of me, just throw Saruman prosthetics on him and we're good to hook for a more vibrant/active/less evil Saruman who helps kick Necromancer @$$ in these two films! "Stout men and lordly they are, and the Riders of Rohan look almost as boys beside them; for they are grim men of face, worn like weathered rocks for the most part, even as Aragorn himself; and they are silent." But as the post said... he would not be around at the time of Bilbo's adventure. Someone mentioned "Princess Bride", and while I doubt it will be exactly like Princess Bride, I can imagine it being something like that. It would certainly fit the Hobbit's lighter tone, being told from the point of view of Bilbo with Frodo listening, substituting Tolkien's unnamed, fourth-wall-breaking narrative voice and the reader. We've been talking about the possibility of Frank Langella playing Saruman for a good while now, and I sort of took it for granted that everyone would know who I was talking about. I think duats was the first one who came up with the idea, but I'm not completely certain. Some months ago I thought no, absolutely not. But as I have sort of given up on the hopes of sir C reprising Saruman, this Langella fellow looks like an OK replacement. It will never be as good as the original, but it should work. I think both you and RosieLass has fair points. Clearly the films have to make money, there's no question about that. The studios would not bother were that not the case. Watching all the appendices on the EE editions many times, though, there are few, if any people involved in making those films who I feel were putting financial gain first. The overriding impression I get from everyone, from the writers, art design, WETA, music, actors, everyone, was the love of the project, and of Tolkien. 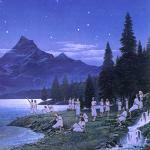 The Hobbit and LOTR are inextricably linked. 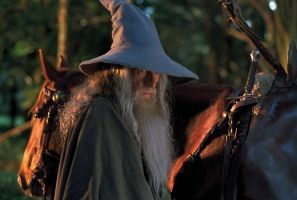 Not just in the ring, Gollum, Gandalf and so on, but the White council, and even the importance of Smaug not becoming a weapon for Sauron, these and many other events tie the two books, and the two sets of films together. It would have been wonderful if Jackson could have made the Hobbit and then gone on to LOTR. He didn't, but I see no problem in him in tweaking things slightly to make the progression from one set of films to the other a little easier, as if he had done that. Samuel L. Jackson for Bilbo, Woody Allen for Thorin, Lewis Black for Bard and Gilbert Gottfried for Smaug! 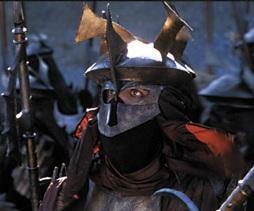 Flagg, there is no reason why Frodo could not be reading the Red book prior to the events of LOTR, is there? He could even be reading an early version of the book, before Bilbo adds the finishing touches? Some way of including Chris Lee is my biggest hope, assuming McKellan and Serkis join, naturally. I suspect Lee might be amenable if some blue screen work could be done. He is a huge Tolkien fan, and I think adding to his body of work as the Definitive Saruman might appeal to him. While i'm not enamoured with the idea of framing The Hobbit within the strict bounds of the existing Lord of the Rings films, which i would have preferred them to build up to on their own terms- consistent with and exploring events within the timeline only revealed in the latter book but nevertheless standing well enough alone, the 'let me tell you a story' format has always been on the cards and to be fair will likely work well enough. It's also a far better way of featuring LotR cast cameos than compressing the timeline by half a century (that said, given the existing compression i consider it entirely possible to show Aragorn and Arwen's first meeting within the narrative of the Hobbit). So yeah, basically i'm non-plussed about it all. If that turned out to be the film's biggest sin then we could all breathe a sign of relief. I got the impression that the bookend scenes would be set towards the end of Return of the King, around the scene where Frodo is writing in the Red Book in his study in Bag End. The earlier they set the scene, the harder it will be to make Elijah Wood look the right age. I suppose they could set the scenes before Lord of the Rings if they really wanted to, but for the purposes of my speculations I assumed that the scenes would be after Frodo's quest. So I just had a thought of how they could do the Hobbit-to-LOTR transition. At the beginning of the first Hobbit movie a young Frodo (Elijah looks perpetually young so he'll be fine) sneaks "the Red Book" out of Bilbo's study and starts reading it bringing us into the world of The Hobbit adventure. Maybe we see Frodo reading it a few more times between then and the end of the 2nd movie. But the end of the second movie should come out of "The Hobbit" story to show Frodo finishing reading The Hobbit in the Red Book while sitting under a tree, effectively ending his narraration - and the camera pans out and Frodo hears Gandalf's singing - and we realize that the famous opening shot of Fellowship of Frodo reading under a tree was actually him reading The Hobbit? Wow! Great idea! I think that could work! Man, I'm excited! It just seems to me that Frodo reading that book could theoretically occur anytime between Bilbo adopting him and the Grey Havens, although clearly Frodo is too young for Wood to play him at the start of that time. A mechanism that could be used, were the timeframe for the reading to be set, say 15 years before FOTR, might allow us to see other events we know happened, and the brief introduction of other characters or story fills. That sort of thing really would not surprise me. For instance, the idea that the films would be structured as if read from a book (Bilbo's book) was first floated here when the bridge film concept was still on the table. IIRC Guillermo himself participated in a thread where that was being discussed (though hovering at the edge of actually spilling the beans, as was his way). At the time there seemed to be general agreement that this was an acceptable, if not desirable, approach to bringing in some characters from LOTR that are not mentioned (which is not the same as did not exist) in The Hobbit and/or the period between the two tales. As for the joking around that goes on here (such as my recent comment: "Itaril of the Ewok Realm"), for the most part, it is not intended to be negative. It is a way of celebrating our shared interests. The period between Frodo and co's return to the Shire and Frodo's departure to Valinor (about 4 years at the end of ROTK) seems the most likely place for the Red Book of the Westmarch to be visited; a time when Frodo would be writing about his adventures, at times reading what Bilbo wrote, and at times connecting the dots between the two tales and filling in the gaps. Alternately they might go beyond that time and incorporate what Sam wrote and of (correct me if I'm wrong) Aragorn's death and Legolas and Gimli's departure for Valinor. Of the two approaches I favour the first, even more so than the idea of Bilbo spinning his tale of "The Hobbit" in a time just before LOTR, or at Rivendell. I'm just tetchy about it. The TORN boards are great, but there was a time back during the years the LOTR films were being made and released when I stopped visiting for a long time because there was a loudmouthed minority who made it very clear that any dissenting opinion was unwelcome, and I got tired of being told to shut up and go away any time I expressed any disappointment over anything Peter Jackson did. "In a hole in the ground there lived a Hobbit" beginning to the Hobbit Movie? Is that off the table now? or will Frodo now say these words? I always thought that it would be a great way to start the movie, just like the book. ...the whole series ends with Sam's "Well, I'm back."